Talk has gone on about the state of the riverfront, but not enough. The topic that sporadically comes up in the news was brought up again a few weeks ago on the Mayor's Blog Hoping to wrest control over some of the 91 acres in order to establish a better landmark that, in the words of Former Senator Danforth, "We want something that transforms our image of ourselves and transforms the rest of the world's image of St. Louis." 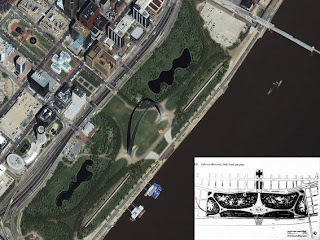 Presently, the Gateway Arch grounds are controlled by the National Park Service. Most St. Louisan's have been there at some point or another. The Museum, a trip up to the observatory. The visit would normally take a few hours. Without sounding too critical, it doesn't really transform the image of St. Louis much. A tremendous landmark, the Arch can become the focal point of so much more that it presently is. Currently, local Mayors and the Danforth Foundation are calling for more local control of the arch grounds. 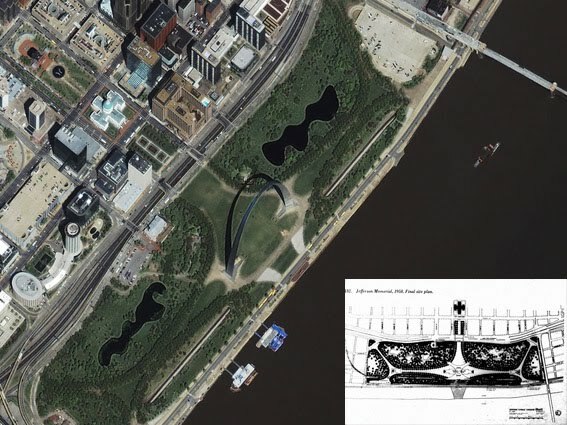 Even the ability to control and enhance a fraction of the arch grounds could benefit the city and our central focal point. Gaining this local control of the Arch grounds won't be easy. According to the article from the Post Dispatch, gaining local control will require broad level support from the community, not just a few in power.